“Coronation Blue” the viral ink art project. – Coronation Blue. 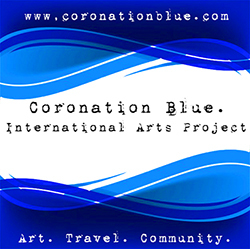 “Coronation Blue” the viral ink art project. A bottle of ink came into the possession of photographer, and Helfa Gelf artist Roy Barry. This bottle, filled with two pints of royal blue ink, and with the words….’Coronation Blue’ upon the label, was made in Treforest in the early fifties, probably shortly after queen Elizabeth ascended the throne. 1953. The year that Dylan Thomas was dying. Unopened, sitting in the dark, and gathering dust for nearly sixty years, this bottle has waited until now to tell its stories. It waited until Roy found it. He conceived the idea that it should be passed from artist to artist, allowing each to use it in their own way. Roy’s job would be to record the process. In this age of global communication, our thoughts are transmitted electronically. Ink no longer has a place, it would seem. Using just one bottle of Treforest ink, could we still reach round the world? Could a global population of artists still communicate from this common fountain? Dylan Thomas was only one of this land’s many writers. This is the land of story, poem and song. The Llangollen International Eisteddfod has been inviting musicians, poets and dancers from all over the world to perform here: to visit out country, and bring their songs, their poems, their stories – and to share ours in return. They’ve been coming for a decade longer than that bottle has sat, waiting in the dark. It’s time to take the lid off again. And it’s time to write the invitations.